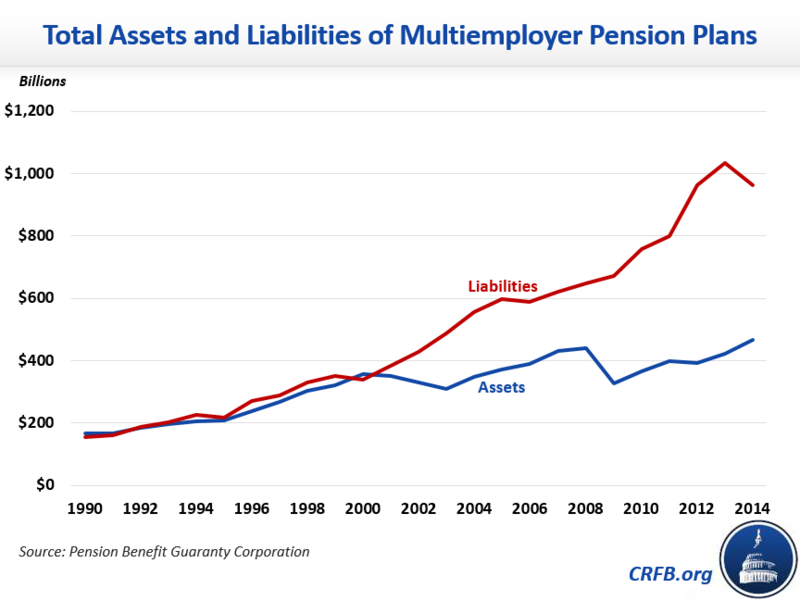 Home » Blogs » Multiemployer Pensions: The Next Source of Budget-Busting Legislation? Multiemployer Pensions: The Next Source of Budget-Busting Legislation? The newly-created Joint Select Committee on Solvency of Multiemployer Plans is tasked with crafting legislation to improve the finances of the nation’s struggling multiemployer pension system, and any legislation recommended by the committee could have a substantial impact on the federal budget. This blog walks through the issues facing multiemployer pensions and proposed solutions – including reforms from the President’s budget and pension legislation sponsored by several Members of the Joint Select Committee. We estimate that an unpaid-for pension rescue could ultimately cost well over $100 billion. What are Multiemployer Pensions and What Problems are They Facing? Multiemployer pension plans are created through a collective bargaining agreement between multiple employers (usually in the same industry) and a union. There are currently roughly 1,400 multiemployer plans and over 10 million plan participants. An important feature of multiemployer plans is that if an employer goes out of business or leaves the plan, the remaining employers inherit responsibility for financing their workers' benefits. Many multiemployer plans have large funding shortfalls. In 2014, the latest year data are available, multiemployer plans collectively promised to pay $963 billion in accrued pension benefits but held only $468 billion in assets. Most underfunded plans hope to close their shortfalls by increasing investment returns or employer contributions, but approximately 100 plans covering around one million participants are "critical and declining" and report they are unable to avoid insolvency within the next 20 years. There are several underlying causes of multiemployer plan underfunding. Pension accounting rules generally encourage plans to hold risky assets, and many suffered heavy losses in the stock market declines in the early and late 2000s. In addition, factors like declining union membership, employer withdrawals, and shrinking workforces in industries with multiemployer plans have caused the ratio of active workers making contributions to retired workers drawing benefits to fall to its lowest level ever. What is the PBGC and How Does it Play a Role? Multiemployer pensions are insured by the government-owned Pension Benefit Guaranty Corporation (PBGC), which also maintains a separate program for single-employer plans. PBGC collects annual premiums from plan sponsors at a flat rate of $28 per participant and in exchange provides financial assistance to insolvent plans so that they may pay benefits up to a certain level (about 60 percent of the typical benefit). Even if PBGC’s multiemployer program was fully funded, participants in insolvent multiemployer plans would still face losses. Unfortunately, PBGC’s multiemployer program has solvency challenges of its own. PBGC and its multiemployer program are intended to be self-financing, and the level of financial assistance it provides is limited to the total amount of premiums and interest it has collected. As the number of plans requiring assistance grows, PBGC and CBO both currently project that the multiemployer program’s funds will be exhausted by the end of FY 2025. The insolvency of the PBGC’s multiemployer program means that participants in insolvent plans would face even greater benefit reductions. A 2016 CBO report estimated that multiemployer plan insolvencies and negotiated benefit reductions would reduce total multiemployer pension benefits by 10 percent below promised levels by 2036 (about 49 percent lower for the most underfunded plans) even if PBGC was able to pay all of its financial assistance claims. The insolvency of the PBGC multiemployer program would boost the average benefit reduction to 17 percent (about 80 percent for the most underfunded plans). To forestall the solvency issue, lawmakers could provide the PBGC with federal funding to meet all of its insurance claims up to its guaranteed maximum. On a cash basis, CBO currently projects the multiemployer fund faces a cumulative shortfall of about $9.6 billion through 2028 and has projected a considerably larger deficit in subsequent years. However, PBGC's liabilities are better measured on an accrual basis that looks at the present value of their lifetime net cost. PBGC currently puts the present value of the multiemployer program's net deficit at $65 billion, and CBO arrived at a similar projection of $58 billion in 2016 when using the same Treasury interest rate to determine present value as PBGC does. CBO has also projected a much greater shortfall of $101 billion on a fair-value basis that accounts for the risk of an unexpected economic downturn that causes more plans to claim financial assistance. Sources: CBO's 10-year cash projection comes from their April 2018 baseline and their accrual projections come from their 2016 report on the multiemployer program. 20-year cash projection is a CRFB estimate based on CBO data. PBGC projection comes from their FY 2017 Annual Report. Unlike its treatment of certain trust funds, CBO does not assume that PBGC will continue paying scheduled levels of financial assistance after the multiemployer program exhausts. That is, legislation that would give PBGC sufficient funding to cover its shortfalls would be scored as costing money. The precarious funding situation confronting many multiemployer plans and the PBGC has led to several proposed solutions. President Trump’s FY 2019 budget included a proposal to improve the solvency of PBGC’s multiemployer program by introducing a variable-rate premium, as exists in the single-employer program. Instead of all plans paying a flat-rate premium, plans funded below a certain ratio would be charged a higher amount given their higher risk of insolvency. The budget also proposes assessing an exit premium equal to 10 times the highest premium rate on employers that withdraw from a multiemployer plan to compensate for the additional risks imposed on PBGC. The Administration estimates these reforms would increase PBGC's receipts by about $16 billion through 2028 and would be enough to keep the multiemployer program solvent for the next 20 years. Another proposal introduced by Joint Select Committee Co-Chair Senator Sherrod Brown (D-OH) and Ways and Means Ranking Member Richard Neal (D-MA), who also sits on the Joint Select Committee, would create a new agency within the Treasury Department that would provide "critical and declining" or already-insolvent multiemployer plans with low interest 30-year loans large enough to enable them to pay full benefits. Multiemployer plans would make annual interest payments but would not need to repay the principal until the 30th year of the loan, at which point Treasury would be required to revise repayment terms and potentially forgive the loans of any plans otherwise unable to pay full benefits. The bill prohibits plans from making any reduction in accrued pension benefits and does not require any contributions from employers, putting the risk and burden entirely on taxpayers. The Brown-Neal legislation would also provide additional financial assistance through the PBGC to plans that would still require assistance to cover their liabilities even if they received a loan. That assistance would not need to be repaid. How Much Would the Brown-Neal Proposal Cost? CBO scores credit programs like the one proposed in the Brown-Neal bill using accrual accounting practices laid out in the Federal Credit Reform Act of 1990 (FCRA), which requires the agency to use the interest rate on Treasury securities when determining net present value. CBO is also required to produce supplemental fair-value estimates, which CBO and many others believe offer a more comprehensive measure of potential costs to the government than FCRA estimates. CBO has not yet released a score of the Brown-Neal bill, but based on the agency's previous analyses it is reasonable to assume that CBO will find the proposal has significant costs, potentially exceeding $100 billion even on a FCRA basis. Proponents of the Brown-Neal legislation have argued that it would come at no cost to the government or that it would be less than the potential cost of covering all of PBGC's multiemployer claims. However, even on a FCRA basis that does not account for market risk, CBO would likely assign a significant cost to the loan program because many plans would likely require partial loan forgiveness or the additional financial assistance from the PBGC also provided under the bill. For example, the Central States Pension Fund, the largest multiemployer plan in critical and declining status, estimated that under the Brown-Neal proposal it would receive a loan of between $11 billion and $15 billion, but that it would be unable to avoid insolvency or repay the loan without the additional $20 billion to $25 billion in PGBC financial assistance it would also qualify for. Moreover, because the proposal would go above and beyond simply meeting PBGC's current multiemployer obligations by effectively guaranteeing pensioners 100 percent of their accrued benefits instead of the current 60 percent maximum, its cost is likely to well exceed CBO's $58 billion FCRA-consistent estimate of the multiemployer program's deficit. In fact, the federal government could be forced to cover the entire pension liability of critical and declining plans, which CBO previously pegged at around $100 billion. If anything, this represents something of a lower bound, as even plans that are currently considered safe run the risk of falling into insolvency and qualifying for loans and assistance under the proposal. There is also a risk that lawmakers three decades from now could simply forgive all loans made to distressed plans if they judged repaying the principal to be too onerous, though this will likely not be reflected in CBO's score. What is the Responsible Course of Action? Multiemployer pensions face serious funding challenges, but so does the federal government. Recommendations from the Joint Select Committee should not add to trillion-dollar deficits and worsen our already unsustainable fiscal outlook. Any pension legislation should be affordable, responsible with taxpayer dollars, and fully paid-for. The best place to start would be to restore solvency to the PBGC's multiemployer program to ensure that it can continue to meet its current guarantees. This could be accomplished by adopting the reforms in the President's budget or other options CBO and others have identified, such as allowing PBGC to raise premiums, reducing PBGC's maximum guarantee, requiring employers to increase plan contributions, or restricting plans' ability to make risky investments. If policymakers decide to offer additional assistance to multiemployer plans, it should be fully paid for. Policymakers have already dramatically expanded deficits by passing unpaid-for tax cuts and discretionary spending increases. They should not allow an unconditional bailout of multiemployer pension plans to be the next multi-billion dollar piece of legislation put on the nation's credit card.